One of the famous vegetable in worldwide. Potatoes are shapeless vegetable but no one can refuse them, when asked. When you think of potato first thing that comes in many peoples mind is french fries.They can be prepared in different ways like baked, sliced or mashed etc. Many people miss out to know that potatoes are rich in vitamin C, Potassium, vitamins b, fibre, copper, manganese and minerals too and can also be used as a cure for skin, hair, and health. Down below I mentioned 22 benefits of potatoes which everyone should know. Potatoes are rich in vitamin B and vitamin C and some minerals like potassium, phosphorus etc that are healthy for the skin. When the raw potatoes are first crushed and then mixed with honey can give a great impact on skin. Potato juice acts as a great moisturiser for dry skin as it hydrates the skin and makes it soft. Applying potato juice with honey over the blemishes can help to get the change on your face. Due to weather changes, our skin use to get irritated and also causes redness due to the irritation, so drinking the raw potato juice helps remove irritation and provides healthy skin. Wash your face daily with the potato juice as it will help in lightening up the blemishes and brightening the skin. Potato juice is good for both dry and irritated skin too. You can apply mask of potato juice with multani mitti(fuller’s earth) and rose water for 15 minutes, twice per week for better results. Peel a raw potato and garnish it well and then keep the garnished potato in any cloth, Apply that under your eyes for at least 20 minutes and then wash your face with warm water, the dark circles under the eyes will start to disappear. Potato, when peeled and mashed and then applied directly on the face, helps to treats wrinkles as potato contains the vitamin C which helps reducing the wrinkles. Potatoes are also helpful in treating the sun burns as you can peel off the potato and cut it into the small pieces and then apply under the burnt skin, it will help curing the burnt skin. Potatoes acts as a skin cleanser as it helps in removing dirt from our skin. Taking one cucumber and potato and then blending in the blender and then adding one teaspoon of baking soda with water and applying on face as face mask, it helps in cleansing the skin. Potato helps in nourishing hair. You can take a few potatoes, grate them well and make a paste by mixing the grated potato with one egg and curd. Apply the paste on the scalp and leave for 15 minutes. If applied once in a month your hair gets nourished and healthy. Take one or two potatoes, extract the juice and then add lemon juice and then mix it well. After preparing the mixture, apply it on your scalp and massage for 15 minutes. Wash it well with shampoo and conditioner. This will help you to get rid of dandruff. Potatoes can also help over to prevent the hair loss which is a very common problem nowadays. Mix potato juice with honey and aloe vera in liquid form and then rub that mixture into your hair and then leave for some time and repeat this process twice in a week, for visible results. Since we know that potatoes are beneficial in each and every means, also they help in treating the grey hair. Boil 1 cup of potato peels with 2 cups of water for 2-3 minutes. After using shampoo towel dry your hair. Then rinse your hair with that boiled potato peel water. Leave it for 5 minutes, then apply conditioner on hairs. Free radicals may cause oxidative damage to our hair. In order to protect them, we can use the potatoes which are rich in antioxidants such as vitamin C which helps to protect from such oxidative damages. Potatoes are greatly known as helpful in digestion. They are a good source of carbohydrates which provides energy to the body while fibre helps digestion and promotes bowel regularity. They may also help to recover from diarrhea. Potatoes are beneficial for our heart. Since they do not contain cholesterol and also contains vitamin C and B6 which are quite helpful to our heart. Potatoes helps in boosting our brain health, they contain a well known enzyme called alpha lipoic acid which boosts brain and resists the memory loss. By drinking a glass of potato juice early in the morning before the breakfast and before sleep at night can help reduce weight. It aids in controlling the level of blood pressure and cures many types of kidney diseases. Mostly people have the problem of swelled up face in the morning, it can be cured by applying potato directly on the face. Potatoes are enriched with vitamin B-6 which works as a stress buster and improves your mood. Potatoes are quite advantageous for eyes as they help keeping our eyes healthy. It also gives relief to our eyes and removes dark circles. Potatoes are packed with many nutrients. 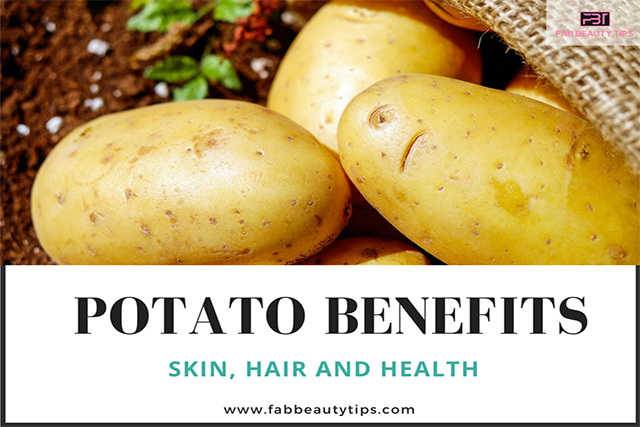 I hope this article has helped you and now you know all potato benefits for skin, hair, and health. If you have used potato to take any of the above benefits do let us know in the comments below. Don’t forget to share it with your friends, Thank You. Hi, this is Roshni Parate. I’m certified cosmetologist. It includes deep study about skin, hair, nails and makeup. Having a proper knowledge about these things inspired me a lot to share my knowledge with everyone. So that everyone can achieve there desired beautiful and trendy look.